The pyramid above the Middle East is the focal point for the first story of humanity. play on Earth’s soil and give it life. Their very existence would be created as a metaphor for the creational patterns of humanity’s earliest roots. And the sacred symbols of this creation would be genetically encoded into those who would come to be part of this land. For it is these souls who would awaken at the end of this cycle to lead the others into the next creation. Darkness would return to Light, And the souls would be free and healed. Join Anrita as we travel in Soul consciousness into the Pyramid of Light above the Middle East holding the holographic encodings of the new Tree of Life, of the Oneness of all Life. Within the Tree of Life, multidimensional gateways of One Unity Consciousness exist, bringing in the Patterns of Perfection including wisdom, protection, strength, beauty, redemption, and Divine Love. And as we climb the Tree, we penetrate beyond the veils of illusion, into One Unity Consciousness and the Cosmic Heart of Mother/Father God, into the recognition of the Divinity of all Life. We cross the bridge of DNA mutation and the polarities on this earth plane, as we climb Jacob’s Ladder and the sacred rays of creation and experience the activation of the 12 Strand DNA in the Golden Age of Light. Overlighted by the Sirian Archangelic League of the Light, forefathers to humanity and Ta-She-Ra El Amun, guardian of the Pyramid of Light, we are offered an opportunity to read and activate our etheric, multidimensional 12 Strand DNA. We travel through each of the 12 multidimensional layers of the DNA, focusing on each layer, and how each layer connects to one another, taking us deeper into our service work as these multidimensional Master Beings of Light and sacred transfiguring Flames of Divine Love. Our unique DNA contains encoded information relating to both our physical and spiritual lineage. It is the blueprint for our life purpose and self-mastery, as well as our physical genetic make-up. In past timelines, our DNA mutated due to the interference of non-ethical Beings, and now, as we enter into the Pyramid above the Middle East, we focus on the Light encodings that embrace duality and activate our so-called “junk” DNA. For it is our ‘junk” DNA that contains the codes of creation, the Patterns of Perfection that will assist us to bring through every aspect of our multidimensional Selves, and the activation of our Adam Kadmon Body of Light. The Pyramid above the Middle East is also a portal of Light, and through the Sun, Central Sun and Galactic Center, our DNA connects into this portal, acting as a transmitter as well as receiver to this wormhole; in other words, the DNA itself is activated through this portal as well as becoming these portals of Divine Light. Portals have the ability to receive information from outside of our time and space, and this information is transmitted in the form of light particles to the DNA. However, the DNA itself has the ability to transmit information in the form of light particles multidimensionally – and this further connects us to each atom and molecule within our Multi-Universe, assisting us in the activation of not only our DNA but the DNA of all humanity on this sacred earth. Layer One: Our blueprint layer and generic encodings. Connects all layers, grounds and roots us as we activate a deeper sense of conscious awareness, primarily through empowerment of Self. Layer Two: Activates a sense of purpose, our Life mission and the belief in ourselves. Layer Three: Lifts the veils of Illusion and adjusts the vibration of the DNA as we clear family and genetic karma. Layer Four: Takes us deeper into alignment with the realms of Illumined Truth and to one another. Layer Five: Connects us deeper to our Beloved I Am Presence and the knowing of our star heritage and angelic/star name. Layer Six: Connects us deeper into Self-Love, into the experience of being these sacred transfiguring Flames of Divine Love. As we accept, appreciate and celebrate the Divinity within each though, feeling and action, the templating of the crystalline consciousness activates more deeply at a cellular level. Layer Seven: One Unity Consciousness. Aligns us deeper to the Cosmic Heart of Mother/Father God and the experience of Unity and Love. This layer further connects us to the Councils of Light, as well as our starseeded family and friends of the Light. Layer Eight: Activates the ability to read the Akashic records, and with this, past lives and parallel realities of our highest potential as initiates of Light. Layer Nine: Our healing layer. This layer assists in the healing of the physical/etheric body with conscious intent, in the rejuvenation and regeneration of the physical/etheric body. It additionally activates the axiatonal lines that run along the acupuncture meridian lines. Layer Ten: Balances the Divine Masculine and Feminine energies in pure compassion, power, Love and Wisdom. Layer Eleven: God Consciousness. This eleventh layer activated our advanced ESP gifts in unconditional Love. All is One. Layer Twelve: Activation the Adam Kadmon Body of Light, the Divine God Human. The Adam Kadmon Body of Light is a part of the energy structures within and around the physical body, taking us into the physical ascension process, and deepens the connection to the Divine as our “living light” body. This brings with it self-mastery and unlimited possibilities. Each layer comes with specific colors, vibrations, affirmations and DNA reprogramming techniques that assist us to recognize what we are still integrating and experiencing to know ourselves as Divine Love. 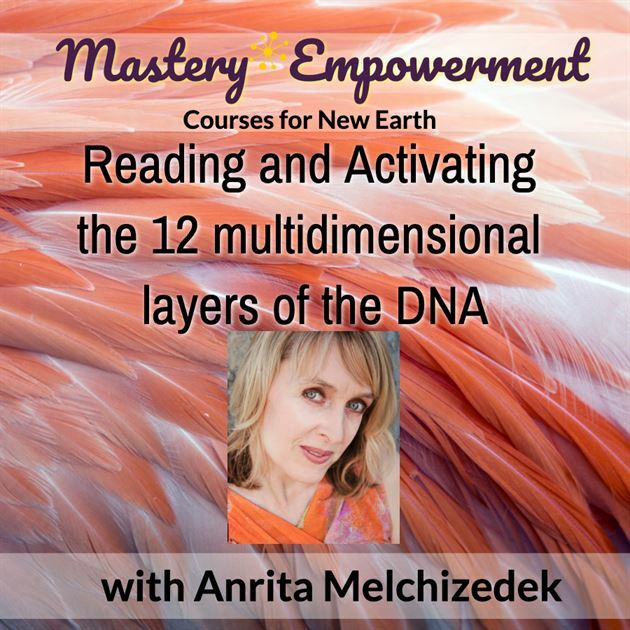 This is a powerful transmission and once you have a sense of the each layer, you will be able to assist others in clearing, reading and activating their DNA. Join us in this powerful transmission of Light, as together we co-create Heaven on Earth in this sacred Golden Age of Light. And so it is.